The power of SAP of is as much as an art and a science. Industry and domain understanding is imperative. As the dynamic business requirements always needs advanced technology SAP solutions to manage any business. We offer various Support and Services on Business Consulting with respect to SAP Technology and brings together industry/domain expertise and a deep understanding and knowledge of the SAP solutions that have consistently delivered value to our customers. BA is a research discipline of identifying business needs and determining solutions to business problems. Which consist of process improvement, organizational change or strategic planning and policy development. The requirements analysis also called as requirements engineering to achieve strategic goals. These changes include changes to strategies, structures, policies, processes, and information systems. We offer strategic management consulting through to project execution our services deliver value for our clients. SAP Business Workflow to design better business processes and ensure that all the processes function systematically. Our SAP Workflow solution involves designing, planning and implementing workflow solutions with quality, cost, time and re-usability. BI enables decision making both at the strategic and the operational levels through intense analytics of the information that is presently available. Our BI innovations will help you bolster your business and implement them showing a positive skew in ROI. The Customer can get maximum value to your ERP solution. Which help organization strategic decision making? Our BI experts have extensive domain knowledge and have catered to clients from varied industries like banking, media, education, healthcare, IT and entertainment. Even if you offer an exotic product or service with just a handful of target audience, we will develop a unique BI solution for you. Business process management (BPM) solutions help organization performance by managing and optimizing a company’s business processes. It is argued that BPM enables organizations to be more efficient, more effective and more capable of change than a functionally focused. These processes can impact the cost and revenue generation of an organization. 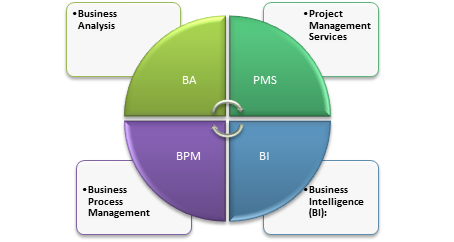 BPM provides framework that helps organization to design, model, implement execute, monitor operate and reengineer to improve business processes. The Process can be managed in Enterprise level, process level and technology level.